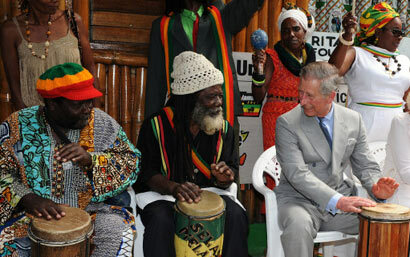 Prince Charles gets a lesson in nyabinghi drumming from Rastafari brethren. The Prince of Wales and the Duchess of Cornwall were wandering through the Caribbean on a big $300,000+ per day yacht (they got a huge discount), Leander, rented from British businessman Donald Gosling, stopping here and there – Trinidad and Tobago, St Lucia, Montserrat and Jamaica. In keeping with international media tradition, the biggest news on the cruise was the visit to Bob Marley’s former home and recording studio in Kingston, the Jamaican capital. And that’s how John Holt flew into my head. So here was the probable king of England visiting the home of the king of reggae and Marley’s RasTafari brethren put the royal highnesses behind some big burru drums and say: beat some nyabinghi sounds wid we, i.e with us. And you know what nyabinghi is said to mean? : death to oppressors! But I doth digress too much. Let’s just take a journal look at their royal highnesses’ (TRH) holiday (sorry, tour) that kicked off in Trinidad and Tobago, the islands of endless fete and oil wealth. First, one has to concede that Charles, like his son Harry, who had to be dragged away from fighting terror in Afghanistan (mummy must be turning in her grave) is brave. They chose to visit T&T which is now rampant with kidnappers and shooters; St Lucia which is pretty but has not one, but two volcanic peaks and a bubbling drive through volcano; Montserrat, still a British possession, which has lost most of its population who migrated because it has been devastated by a volcano, and Jamaica, which, as TRH press corps reported, is a world murder capital with more than 1,500 people killed in 2007. Indeed, the heir to the British throne must be commended for his visit to the inner-city Kingston community of Rose Town – known as a political garrison because it was ruled by political henchmen, known as dons or shottas (shooters) – where his Prince’s Foundation for the Built Environment, is working with the Kingston Restoration Company to help regenerate the deprived area. The tour formally began in Trinidad where the prince met with President George Maxwell Richards and Prime Minister Patrick Manning. Trinidad is cooperating with Britain in the area of security and during their stay the royal couple viewed a maritime interdiction exercise conducted by the island’s coast guard. The prince also visited the island’s special anti-crime unit’s new training academy, which has been set up with the assistance of British police officers. During a dinner hosted by the President, Charles addressed his pet topic on the importance of protecting the environment, calling for a Commonwealth partnership to create a network to link climate change champions from individual companies to share ideas and expertise, and to spread best practice. After attending a service at Tobago’s oldest Anglican church, the royals travelled to the Tobago Marine Research Centre where they met people involved in coral reef protection and learnt about the work of the Buccoo Reef Trust, a non-profit organisation set up to protect the Tobago’s marine environment and to promote sustainable marine tourism. So it was onboard the Leander for St Lucia where they were met by the island state’s Governor General Dame Pearlette Louisy and other dignitaries. Having visited the picturesque mountain town of Soufriere, a cocoa processing operation and a tourism facility Charles hosted a meeting on sustainable eco-tourism aboard the Leander with hoteliers, farmers and St Lucia’s Minister for Tourism. “One of the great tragedies as far as I’m concerned, for what it’s worth, is seeing people lose confidence and faith in their own culture and their own identity,” the prince told the group. It was an ironic twist that the Economist newspaper in commenting on the royal visit in an article headlined, “Crown an Anchor” noted that only Dominica and Trinidad and Tobago (they overlooked Guyana) among the ex Caribbean colonies had ditched the queen as head of state and opted for republican status, supposedly because of a fear that a president as head of state sounded less democratic. On their Montserrat stop the couple witnessed first-hand the destruction caused by the 1997 explosion of the Soufriere Hills volcano. From a distance they viewed Plymouth, the former capital which was buried under tons of ash and mud during two years of volcanic activity which culminated in an explosion. After a few days sailing across the Caribbean they hit Jamaica and apart from the trip to the Marley Museum, they visited the Georgian town of Falmouth on the island’s north coast, being restored as part of a heritage program. So they’re gone now after a reggae soca trip, safely headed home – meaning any one can visit the Caribbean, have a good time and get home alive. And oh, that John Holt song, Ali Baba, it was about a dream that involved many of the characters you’d have met in fables and fairy tales, which is not quite the daily life for permanent residents.